Business Continuity is Vital to Success - GC Infotech LLC Work Smarter! In our interconnected world, virtually every aspect of your company’s operation is vulnerable to disruption. Research shows your business is more vulnerable than you think. But what is Business Continuity anyway? Business Continuity is the activity performed by an organization to ensure that critical business functions will be available to customers, suppliers, regulators, or anyone that must have access to those functions. It’s not something implemented at the time of a disaster (too late!) – it refers to those tasks you should perform daily to maintain service, consistency, and recoverability. Your Business Continuity Plan should be something that is constantly evolving and adapting to changes in the business environment. The entire concept of business continuity is based on identifying and then prioritizing all business functions within an organization. A comprehensive business risk analysis is the primary tool for gathering this information and is therefore the first step to developing your business continuity plan. 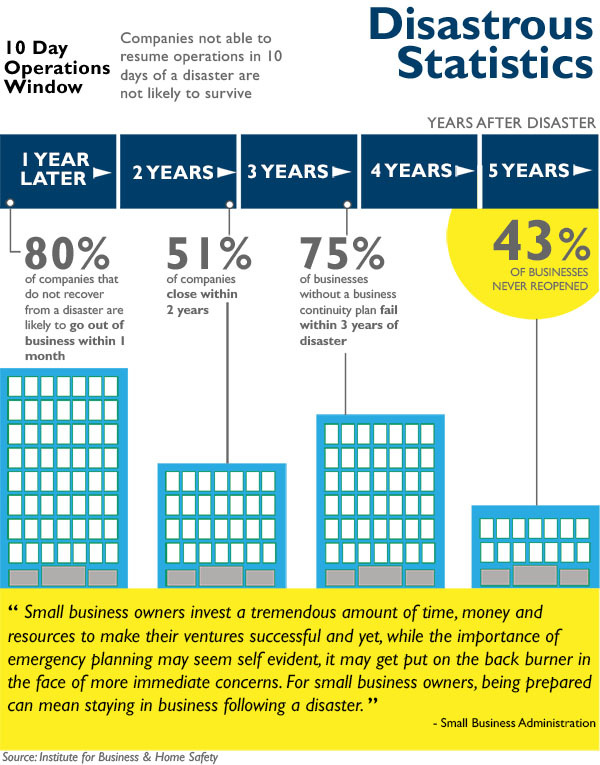 Does your business have what it takes to survive? Establishing a continuity and disaster recovery plan is an essential part of any long-term strategy for maintaining continuous business operations. Sound disaster recovery and business continuity planning should be three things: preventive, detective, and corrective. Prevention is your first line of defense. But when undesirable events do occur, detection before they occur is critical, and correcting the system after they occur may dictate the survival of your business. Natural disasters, security breaches and man-made accidents do happen. It’s how we plan for them that will ensure our survival. According to the Quorum Disaster Recovery Report, Q1 2013, which details findings on the most common causes of system downtime, the four most common causes of system downtime were: 1) Hardware Failure 2) Human Error 3) Software Failure and 4) Natural Disaster. A media company in Wilton, CT recently asked for our help because they consistently lose power in the office anytime there is a storm and it was significantly affecting their business. We couldn’t help that the power was going out and we certainly couldn’t influence the weather, but we could help them continue to be productive when these things happened. We made some changes to their email system that took it from an in-house function to an externally hosted function that would not be affected when the power went out in the office. By doing this, it gives the employees the ability to continue to be productive and access their email from home or anywhere there is an Internet connection. In this case, simple preventive steps to ensure everyone could use email despite external factors has allowed for business continuity following a storm and has made a big impact on productivity. GCInfotech can help you assess how potential risks will impact your ability to deliver products and services.